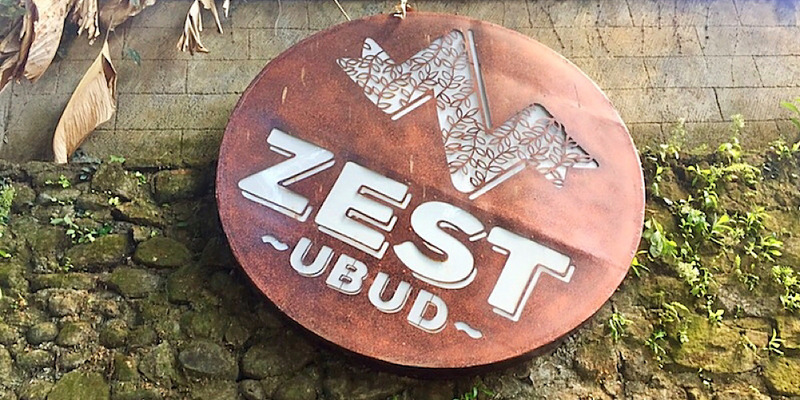 The ultimate sensory immersion experience that is Zest Ubud in Bali - Powered by plants, made by people. This post has advertisement / affiliate links. See disclosure for more. The first thing you see when you arrive at Zest are amazing sculptures, temples and architecture. 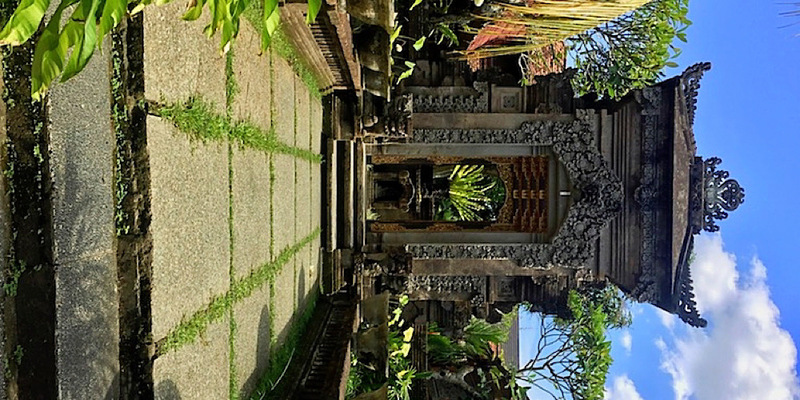 Balinese architecture, much like Balinese culture, is always inspiring. Entering the restaurant is walking into a giant, open-air, atrium that surrounds a living tree. There are seats and tables everywhere, from wooden dining tables to plush seats to cozy sofas to modern hanging lamps, no detail was overlooked. It's warm, inviting, calm and energizing all at the same time. Ditch your shoes and enter the hive. Settle into whatever cozy spot calls out to you. Soften into your seat. Breathe the air. Enjoy the breeze. Marvel at the art. Feel the architecture. Appreciate the plants. Look at the lights. Listen to the music. Inhale the delicious scents. Smile back. Because everyone is smiling. And then get ready for more... Food. 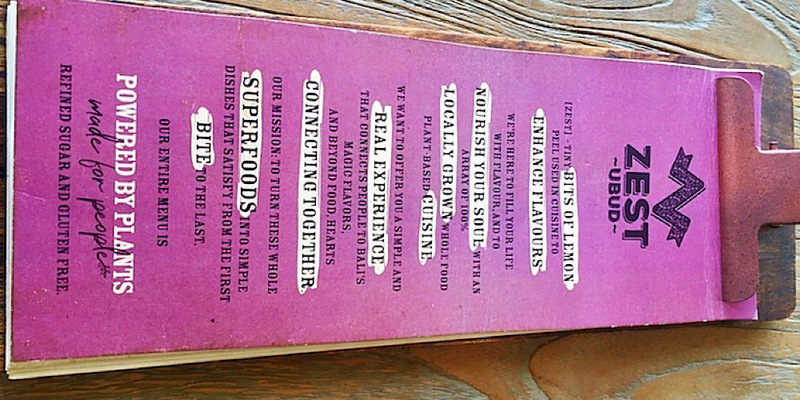 This menu is unique because it highlights native superfoods such as moringa, soursop, starfruit, mung bean, jackfruit, cassava, and turmeric, and blends them all into creative inventions that taste great. Superfoods have numerous health benefits and incorporating these nutrition powerhouses into the core of the menu is genius. 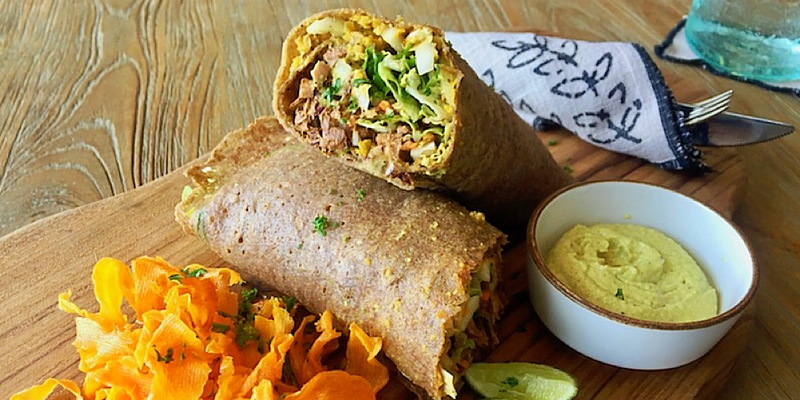 Bowls, wraps, salads, flatbreads, soups, tapas plates, and creative mains like sushi, jackfruit steak, and eggplant pate will wow your taste buds while cheesecake, muffins, brownies, pies and puddings will finish you off right. Tea, coffee, smoothies, juices, and an entire rainbow of drinks will wash everything down with the most colorful flair. 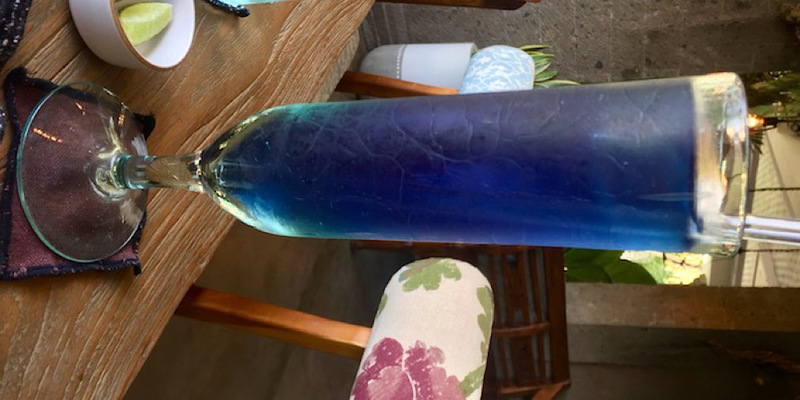 Because blue drinks are special, I had to go for the Long Blue. An intoxicating blend of moringa, a native plant packed full of enzymes, vitamins and minerals, plus butterfly pea flowers, mint, basil and cinnamon. Refreshing, spicy, and sweet, it is quite a nutritious treat, all in a calm, cool ocean blue. Jackfruit is mind-blowing. This meaty fruit can mimic pulled pork in such a freakishly realistic way that it's a perfect comfort food for us Americans. 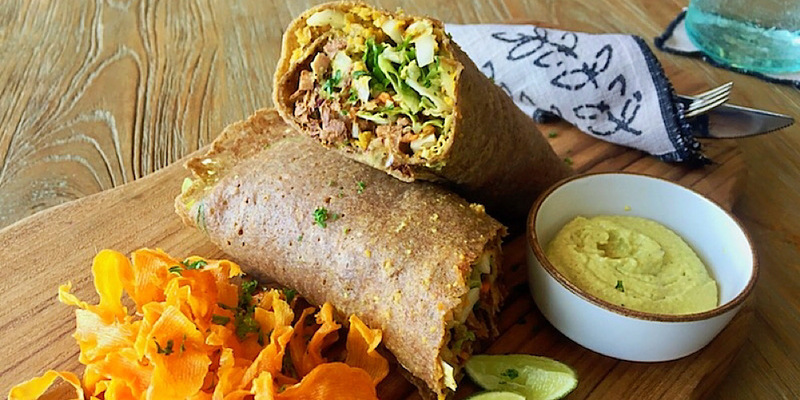 Run Piglet, Run is Zest's stellar jackfruit wrap. With grilled jackfruit, greens, tomato, sauerkraut, and carmelized onions, this taste explosion is finished off right by a tangy housemade curry mayo. 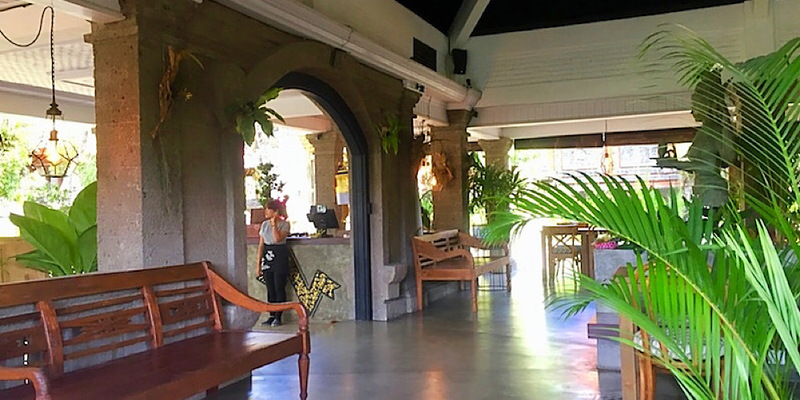 Zest Ubud is a sensory experience that you have to feel in person. Much love goes out for their commitment to being an eco-conscious establishment aiming for zero waste by using cloth drink coasters, cloth napkins, glass straws, and wooden serving boards. When absorbed into the blissful musical vibes, you can stream their playlist on Soundcloud. Go visit Zest at Jl Raya Penestanan Kelod 8. It's just up the hill right before it starts to curve. 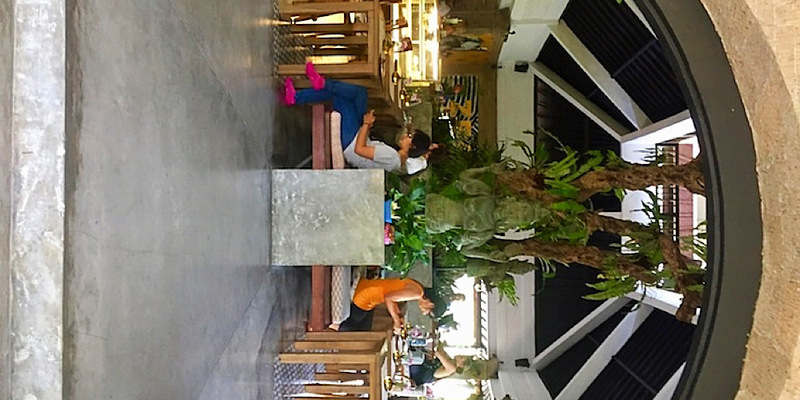 It's the start of all the amazing foods in Ubud.